← TRUMP AND TRADE AND FOREIGN POLICY — Mercantilism and Isolationism? Calls for Trade Reform — Recent Proposals …… Are They Sufficient? More aggressive use of U.S. antidumping provisions. Increase the investigation authority of the Trade Representative’s Office (USTR). Expand enforcement tools of the International Trade Commission (USITC). Authorize the ITC to issue advisory opinions on private enforcement claims. Bolster the Trade Adjustment Assistance program, for example, by providing limited wage insurance when jobs are lost due to imports. To me these are sensible proposals but they only go to the margins of the problem. The loss of manufacturing jobs is a driver in the trade debate today in the US and abroad. But it is by no means the whole story. It is clear to me that the answer in rebalancing the domestic trade debate is that a broader discussion is required of the nature of global trade, the global geopolitical system and the benefits for us. This newer dialogue involves discussing the grave failure of the US to invest in infrastructure that would make us more competitive. It also involves interlocking issues of global taxation, the role of foreign investment, regulating multinationals, multilateral institutions and their dispute resolution systems, among others. The following issues also need to be discussed: dark (secret) money, bank secrecy and corruption. They are unwelcomed hitchhikers on global economic transactions. They hinder economic development and reduce popular support for the trading system worldwide. Sometimes one event doesn’t really tell us much. But the rough discourse over trade today does tell us that there is huge discontentment with U.S. global trade policy. This needs to be addressed by addressing the broad range of core issues. 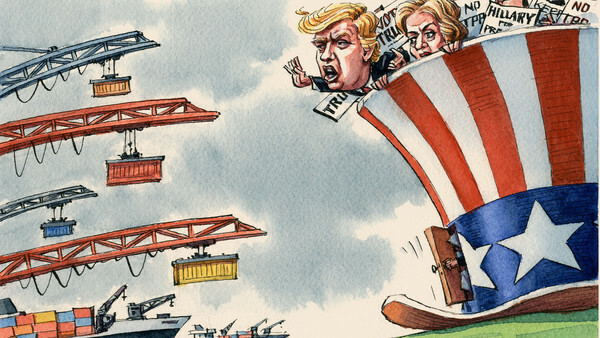 ……………… “Rethinking the Politics of Trade.” Wall Street Journal (May 5th, 2016).